Download "LEGAL RIGHTS AND OPTIONS IN THIS LAWSUIT: The only way to potentially receive money from this Settlement." 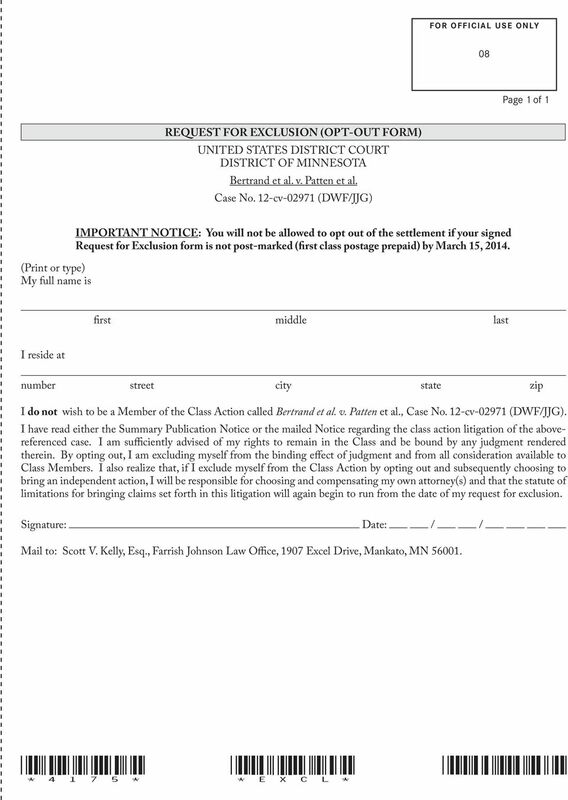 1 LEGAL NOTICE UNITED STATES DISTRICT COURT FOR THE DISTRICT OF MINNESOTA Individuals Whose Minnesota Driver s License Records Were Accessed for Illegitimate Reasons May Benefit from a Class Action Settlement. A court authorized this notice. This is not a solicitation from a lawyer. 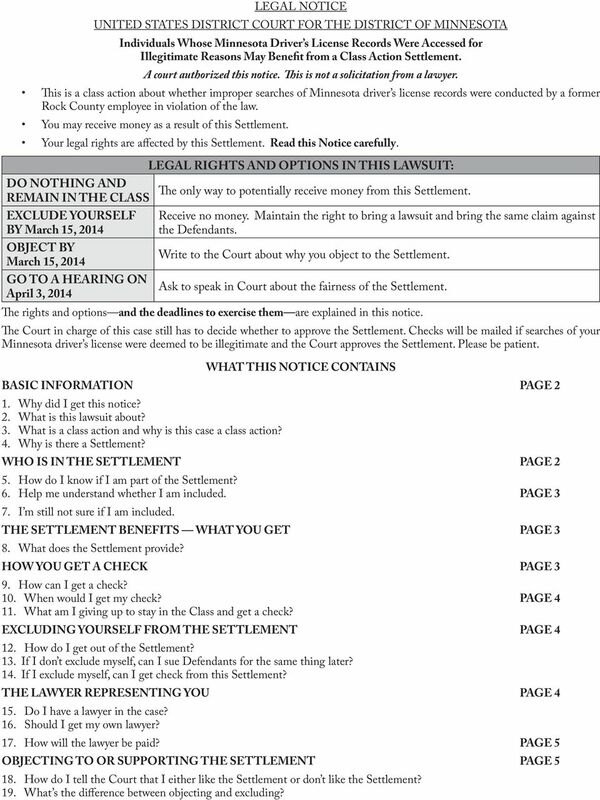 This is a class action about whether improper searches of Minnesota driver s license records were conducted by a former Rock County employee in violation of the law. You may receive money as a result of this Settlement. Your legal rights are affected by this Settlement. Read this Notice carefully. 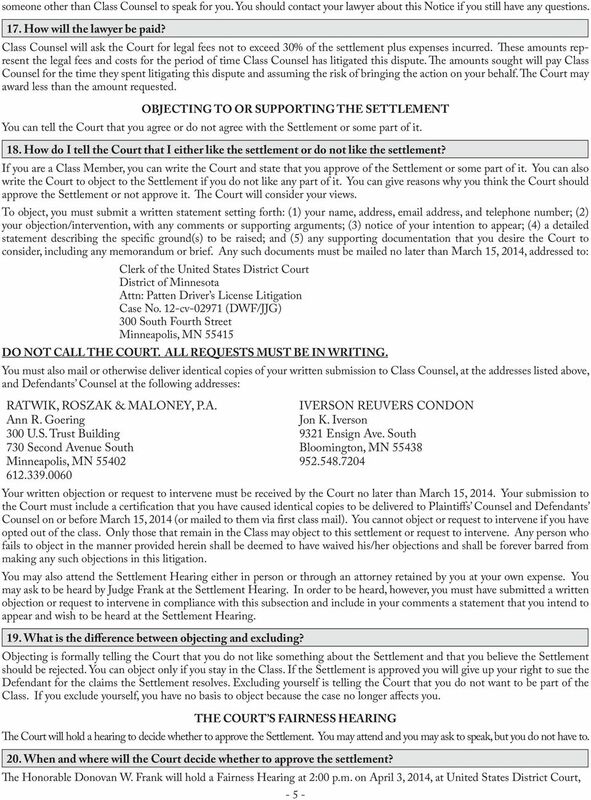 DO NOTHING AND REMAIN IN THE CLASS EXCLUDE YOURSELF BY March 15, 2014 OBJECT BY March 15, 2014 GO TO A HEARING ON April 3, 2014 LEGAL RIGHTS AND OPTIONS IN THIS LAWSUIT: The only way to potentially receive money from this Settlement. Receive no money. Maintain the right to bring a lawsuit and bring the same claim against the Defendants. 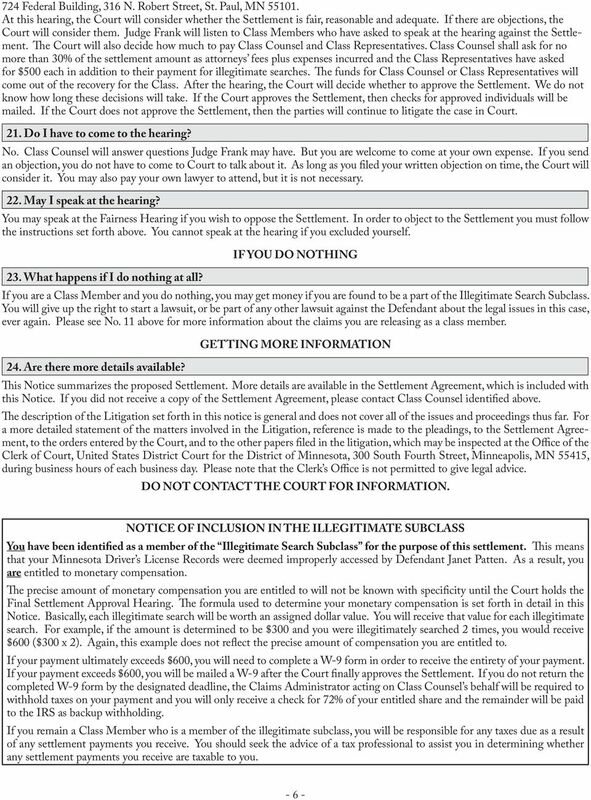 Write to the Court about why you object to the Settlement. Ask to speak in Court about the fairness of the Settlement. The rights and options and the deadlines to exercise them are explained in this notice. The Court in charge of this case still has to decide whether to approve the Settlement. Checks will be mailed if searches of your Minnesota driver s license were deemed to be illegitimate and the Court approves the Settlement. Please be patient. WHAT THIS NOTICE CONTAINS BASIC INFORMATION PAGE 2 1. Why did I get this notice? 2. What is this lawsuit about? 3. What is a class action and why is this case a class action? 4. Why is there a Settlement? 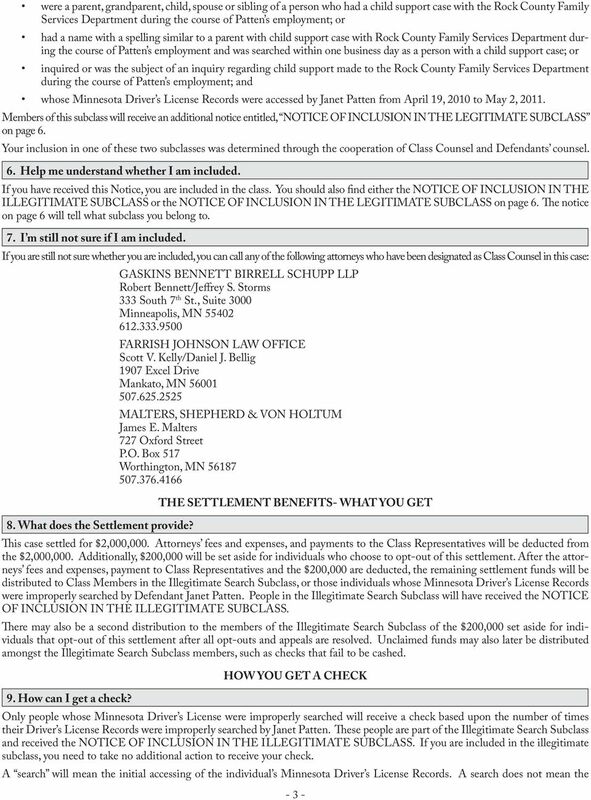 WHO IS IN THE SETTLEMENT PAGE 2 5. How do I know if I am part of the Settlement? 6. Help me understand whether I am included. PAGE 3 7. I m still not sure if I am included. THE SETTLEMENT BENEFITS WHAT YOU GET PAGE 3 8. What does the Settlement provide? HOW YOU GET A CHECK PAGE 3 9. How can I get a check? 10. When would I get my check? PAGE What am I giving up to stay in the Class and get a check? 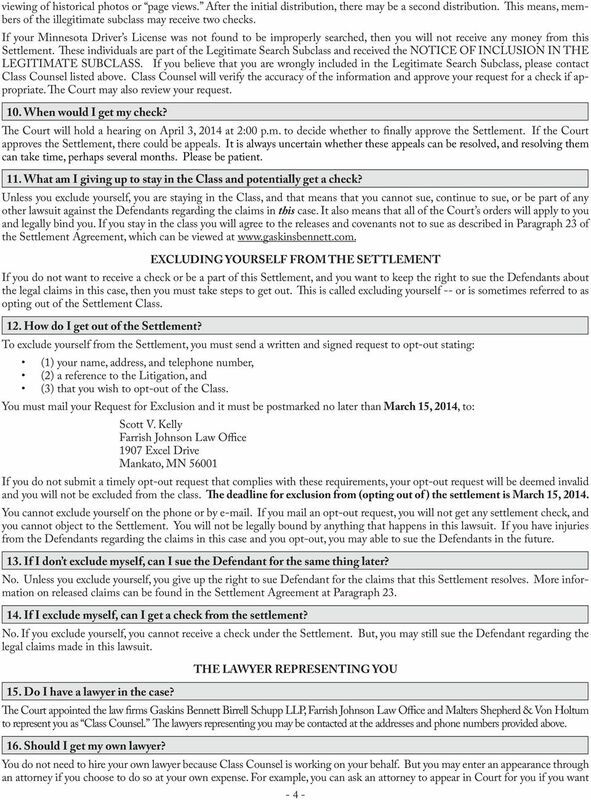 EXCLUDING YOURSELF FROM THE SETTLEMENT PAGE How do I get out of the Settlement? 13. If I don t exclude myself, can I sue Defendants for the same thing later? 14. If I exclude myself, can I get check from this Settlement? THE LAWYER REPRESENTING YOU PAGE Do I have a lawyer in the case? 16. Should I get my own lawyer? 17. How will the lawyer be paid? PAGE 5 OBJECTING TO OR SUPPORTING THE SETTLEMENT PAGE How do I tell the Court that I either like the Settlement or don t like the Settlement? 19. What s the difference between objecting and excluding? UNITED STATES DISTRICT COURT DISTRICT OF NEW JERSEY STEPHEN TREWIN and JOSEPH FARHATT, On Behalf of Themselves And All Others Similarly Situated, Plaintiffs, vs. CHURCH & DWIGHT CO., INC., Defendant. Civ. If You Paid Overdraft Fees to Capital One, Hibernia, or North Fork, You May Be Eligible for a Payment from a Class Action Settlement. REQUEST FOR EXCLUSION FROM SETTLEMENT. JENKINS V. GOODWILL INDUSTRIES OF THE GREATER EAST BAY, INC., Alameda County Superior Court Case No. Your legal rights are affected whether you act or don t act. Please read this Notice carefully. If You Paid Overdraft Fees on Debit Card Transactions to Bank of America, You May Be Eligible for a Payment from a Class Action Settlement. UNITED STATES DISTRICT COURT FOR THE EASTERN DISTRICT OF PENNSYLVANIA If You Paid Overdraft Fees on Debit Card Transactions to Bank of America, You May Be Eligible for a Payment from a Class Action Settlement. 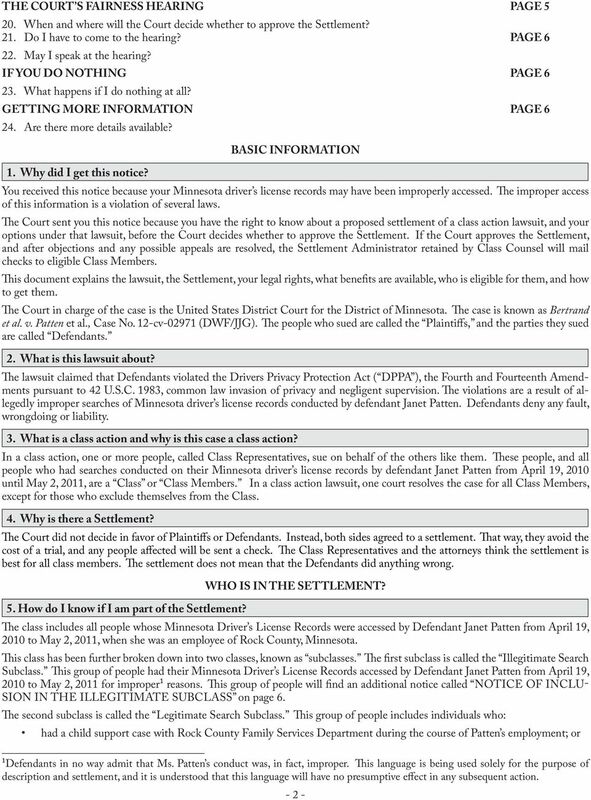 UNITED STATES DISTRICT COURT FOR THE WESTERN DISTRICT OF WASHINGTON In re Classmates.com Consolidated Litigation, Case No. A Federal Court authorized this notice. You are not being sued. This is not a solicitation from a lawyer. If you worked as a Service Technician at Source Refrigeration & HVAC, you could get a payment from this class action settlement. There is a Proposed Settlement in a class action brought against Chesapeake Appalachia, L.L.C. on behalf of certain royalty owners. UNITED STATES DISTRICT COURT FOR THE MIDDLE DISTRICT OF PENNSYLVANIA There is a Proposed Settlement in a class action brought against Chesapeake Appalachia, L.L.C. on behalf of certain royalty owners.